This benefits open-enrollment period, your employer may ask you—even force you—to enroll in a high-deductible health insurance plan with a health savings account. While premiums on high-deductible health plans are typically 10% less than those of more tradi­tional PPO plans, according to data from the Kaiser Family Foundation, co-insurance doesn’t kick in until you’ve paid much more out of pocket. On average, you’ll foot the first $2,200 in costs as an individual, or $4,500 as a family. (Employers like the plans because they motivate you to be more discerning about your spending.) To pay the bills, you can save pretax dollars—up to $6,650 for a family—in a health savings account (HSA). Most companies throw in cash to sweeten the pot. Compare costs for a typical year. Your employer, hopefully, will make this easy for you: This fall, 76% of companies plan to offer tools to help employees assess plan options, says Towers Watson. Often these build in your current year’s usage of health services. No such luck? Estimating your total costs under each plan isn’t easy, but it’s necessary to make the right choice. Start by reviewing your 2014 explanation of benefits statements—probably available on your insurer’s website—to see the insurer-negotiated prices for your usual services, says Paul Fronstin of the Employee Benefit Research Institute. 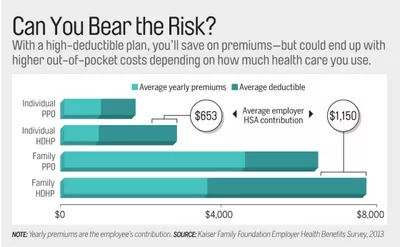 Add the premiums to your expected out-of-pocket costs in each plan—up to and after deductibles—and subtract any employer HSA contribution for the high-deductible option. Gauge your cost tolerance. An American Medical Association study found that 43% of higher-income families in high-deductible plans had delayed or forgone care because of the cost. Almost a third of them reported greater stress, and 15% suffered a disability as a result of putting off care. If you’re likely to skip treatment to save a buck, this plan isn’t your best choice, particularly if you have a chronic condition. Be a savvy consumer. High-deductible plans put the onus on you to be price-conscious. Learn the costs of procedures in advance, and ask questions like “How will this test result affect what you do for me?” says Jacksonville financial planner and MD Carolyn McClanahan. Prices vary wildly, so comparison shop for services like blood tests and MRIs. It’s in your interest to get the best deal you can.